Sawmill Nordic Centre has had much snow this season. We have a wonderful base and should easily ski past the March Break this season. Our equipment has stood up to what has been required so far with some minor repairs. 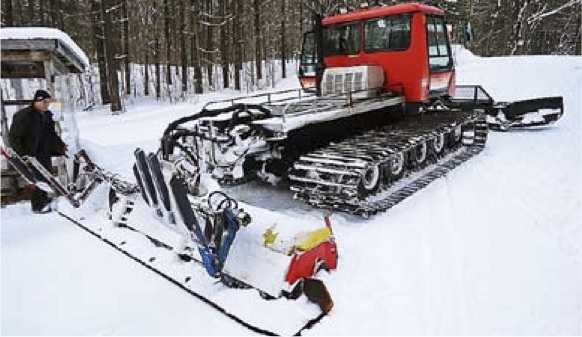 The New Freefall has provided our groomers with some new challenges and we will probably re-design some of that section. Our grooming guys, Harry Hong, DJ Perrin, Zane Davies and Fred Scheel have the pleasure adding two new guys to the team, Neil Sim (2nd year) and Ron Downie. I know our membership appreciates how dedicated these guys are in providing great skiing for our members. (PS. Zane and wife just added a new groomer to the team, should be ready in 18 years). The Snowshoe Trail seems to be generating lots of use. The fee structure for snowshoeing has been reduced to $5 per day for non-members. See you on the trail, and enjoy.